No bull - the longest wearing nail polish, I have ever worn! Tried and tested. Sally Hansens new, Hard as Nails, Xtreme Wear LASTS! I swear to you, I would never lie. It has been tried an tested by me. Here are my pictures of proof. From Lime Lights to Ruby Stilettos, the Sally Hansen Hard As Nails Xtreme Wear shade palette offers a range of colours that are upbeat, wearable and can reflect any style or mood. The trendy nail colour is combined with the benefits of shiny, long-wearing colour. 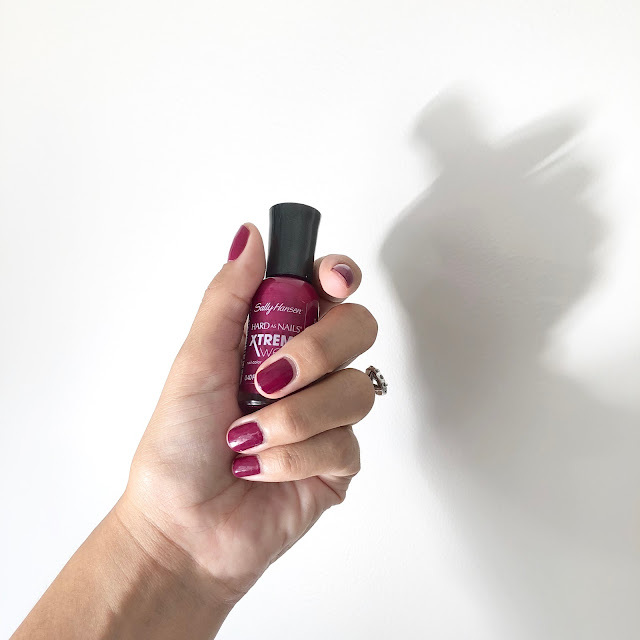 It is thanks to Sally Hansens microfine bioactive glass also bonds to the nails for shatterproof, shiny hard colour that resists chipping and peeling, and lasts up to 7 days. This is 7 days of wear, you can see that the nail polish has grown out, as my nail has grown. There are no chips, I can’t believe it myself! Well done Sally Hansen, keep doing what your doing. You have cracked the code!! Have you tried it? We would love to know your thoughts.